From the stunning turns of events in Boston and Texas to, locally, the provincial budget and the government’s plan to hike of the PST as of July, it’s been a hell of a week for news. But on top of emerging craziness, the Phoenix Sinclair Inquiry resumed witness testimony after several weeks off, partly due to the delay caused by perceptions of conflict. And while the evidence heard this week was at times disturbing and concerning (Cpl. Rob Baker’s testimony, along Alison Kakewash’s hit me personally like a ton of bricks), I’ve been turning my mind more often lately to what Commissioner Hughes could be making of it all. As we approach what’s sure to be the gloomy end of Phase 1 on Tuesday or Wednesday, it strikes me there are two nuts-and-bolts recommendations Hughes could make today to fulfil his mandate to help better protect Manitoba kids. This been a frequent underlying issue at the hearings so far. 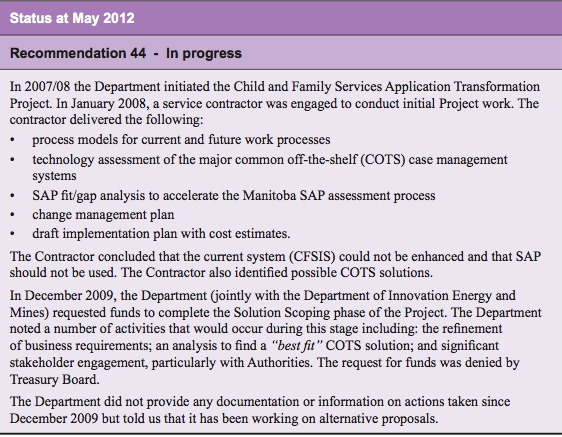 An old Child and Family Services database (CFSIS) limping along. Lack of consistent Internet access for CFS agencies outside major centres. That lack of infrastructure leading to a ‘why bother’ kind of attitude from workers, leading, in turn, to a lack of due diligence in doing things like Prior Contact Checks — the very thing which could have “changed everything” in Phoenix’s case. I’m reasonably sure Hughes has turned his mind several times now to the technology issue. There’s no reason in this day and age all communities shouldn’t have proper access to the CFS computer system. We can put infrastructure in remote areas to ensure VLT/Casino data is accessed daily. Surely we can do the same for child-welfare services. 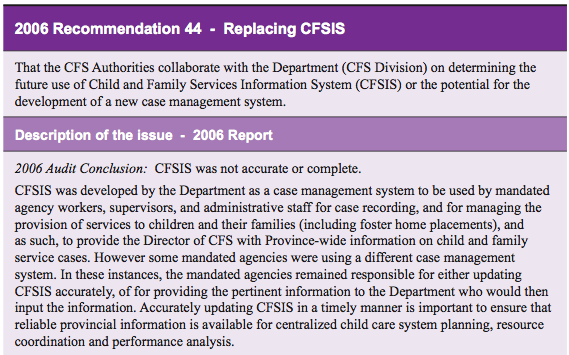 Last fall, the Auditor General specifically noted that the province has been slow to implement a number of key recommendations dating back to a 2006 CFS audit — and electronic case management and tracking was among them. So obviously the powers that be are aware of the problem. This is a fundamental issue. And when you have a veteran cop like Cpl. Baker saying sharing between various government agencies — such as CFS, Employment and Income Assistance, Health and police — could be better, it probably could be better. Instead, we’ve heard several times now how people’s fears at violating privacy and health privacy legislation has led to slowdowns in the investigative process. Baker said RCMP, his police service, has no issues quickly sharing certain information with agencies conducting “like minded” investigations — but found when investigating Phoenix’s homicide there was pushback from CFS when he hoped to access sealed “child in care” files held by a CFS agency. 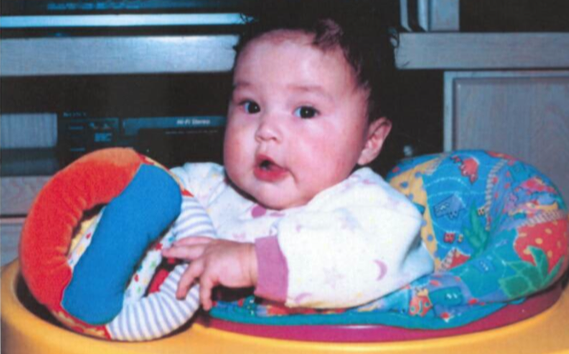 Luckily, EI investigators were ready and willing to co-operate and set up the ultimate “sting” which exposed Kematch and McKay — and Phoenix’s death — nine months after it happened. 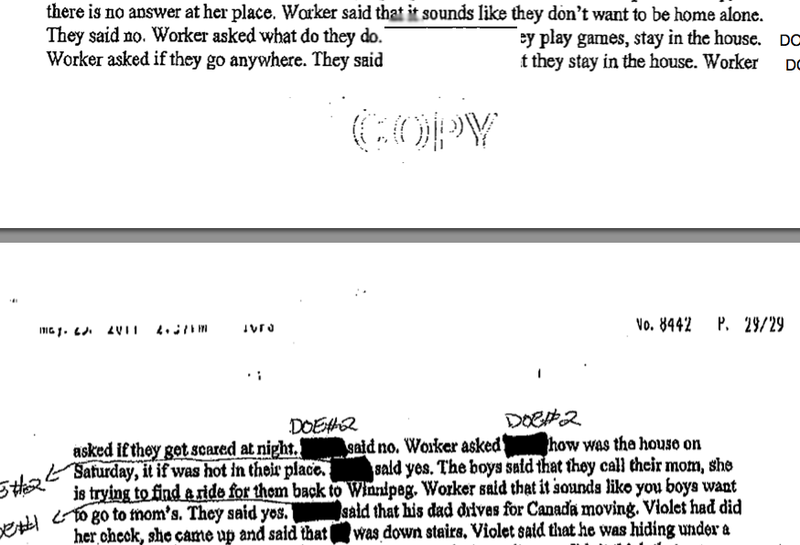 Workers investigating a child-protection case shouldn’t be hamstrung by having to invoke “magic words” to glean information quickly out of other agencies who may have valuable data, and vice versa. Any abuses could be ferreted out with a strong quality-assurance program. Information is like oxygen to investigators of all stripes. If we believe they are working towards valuable goals [like the safety of at-risk kids], they shouldn’t have to fight for information. But it’s a contentious issue, for sure. Even police agencies can’t figure out a way to co-operate when it comes to data sharing, as this (to my mind, sad) report out of Alberta suggests. A massive child-welfare inquiry in Australia is about to wrap up with a final report from its commissioner by June, likely earlier. What’s relevant is how many issues there are echoed over here, particulary the concerning rise in the number of kids being taken into care, largely because of neglect, not abuse. The website is a model for future inquiries, I feel. It’s easy to find the disclosure, they took it on themselves to live-stream it, and staff even communicate with the public via social media. As well, people are encouraged to participate by sending submissions to the commissioner. While I’m not knocking the effort for Phoenix’s inquiry — communications staff have bent over backwards at times to ensure media have been given proper access — but perhaps a few more of the $9.6 million we’re currently spending could have gone into making the proceedings and website more accessible to the public, virtually all of whom can’t make it to take in the hearings during working hours. The design is a bit dated — and it’s very difficult to navigate the disclosure which has been presented, unless you note page numbers as you go along. Here’s the recent discussion paper from the Australian affair. I’d love to foster a discussion about it with readers, so chime in in the comments and we’ll make it happen somehow. Perhaps through a live blog of some kind. Late edit: I just wanted to point out some things which have been picking at me, relating to the internal CFS documents tabled at the inquiry. 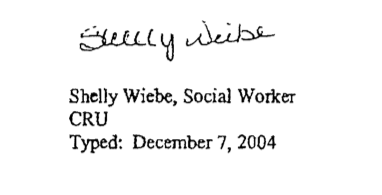 This was the file closing of Shelly Wiebe from December 2004. But her signature states it’s EI. That’s odd, no? Who misspells their name in their signature? Here’s another oddity, from this week’s report from Intertribal CFS. Why is it that it’s the same report — just one page apart (you can see the page break) — but the formatting in terms of spacing is so different? It’s weird. There’s been a few other instances of documentary oddness. I’ll add them as I come across them. Chris Campbell: Another tragic case of under-resourced mental health/criminal justice services?